It is officially Fall, and for some of us that means colder weather is coming. Colder weather most likely means higher heating bills are also on the horizon. For us, our heating bill increases around $100 a month and becomes around $150 a month once the colder months come. I know that for some $150 is not a lot when it comes to monthly heat bills. 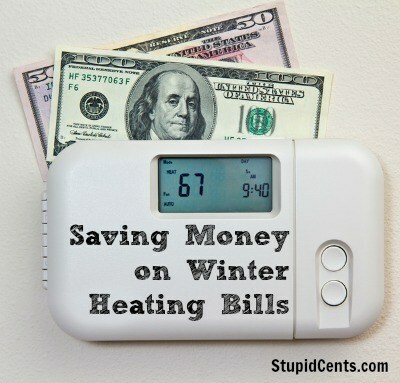 I have heard of others who have said that their monthly heating bills are around $400 or more each month. That just seems crazy! We have always done little things to lower our utility bills, so I do think that is why our bill isn’t as high as others. What do you keep the temperature at in your home during the winter? If you usually keep the temperature in your house at 75 in the winter, would you ever keep it at 70? I’m sure a five degree difference would not be too different. Five degrees can also mean a good amount in monthly heat savings. Of course, you do not want to turn it down too low because if you completely switch off the heat and temperatures are below freezing, then pipes might freeze or burst and that will lead to many other problems. You can also turn down the heat around 10 degrees whenever you are not home for a long amount of time. If you are at work and work for 8 or 10 hours, turn the heat down when you are not there. Or, if you don’t mind it being a little colder while you sleep, then try for just one night turning down the heat an extra five degrees. you can lay under additional blankets and it will probably feel the same. What do you wear in the winter when it is freezing outside? Bundling up can mean that you can turn the heat lower and save more money. Instead of wearing shorts, wear pants. Throw on your favorite sweater as well. I love bundling up inside when it’s freezing outside. Do you have any small openings in your windows or doors? You are letting cold air in and this should be fixed as soon as possible. There are many things that you can do to fix any drafts. Windows can be caulked, and there are inserts for doors to stop drafts as well. In the winter, make sure to switch your fans to the winter setting. If it doesn’t say “winter” on your fan, then just make sure that it is turning clockwise. There is usually a simple switch directly on the fan that you can turn. Changing the fan direction pushes warm air back towards the floor. Insulating your attic and not letting warm air escape through the walls of your home. Complete maintenance on your furnace. Install water-efficient shower heads in your showers to use less water and to use less hot water. What else would you add to this list to lower your heating bill?